Large needlepoint of George Washington, stitched in England mid 19th century, surely from a kit designed for the Centennial Celebration in 1876. Perfect condition, and 30 inches tall. This lovely framed needlepoint picture is framed and glazed with a period frame and is guaranteed to be a mid-19th century example. 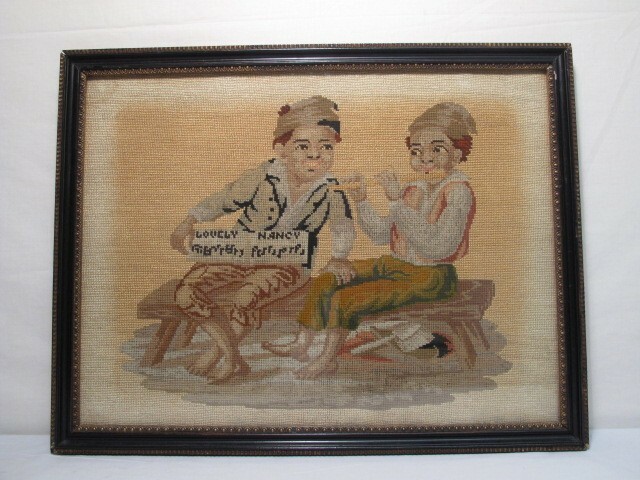 The picture is of two kids, one playing what appears to be a flute and the other holding the music. Under the title Lovely Nancy is a row of music notes. Great condition. No marks from moths or dirt. 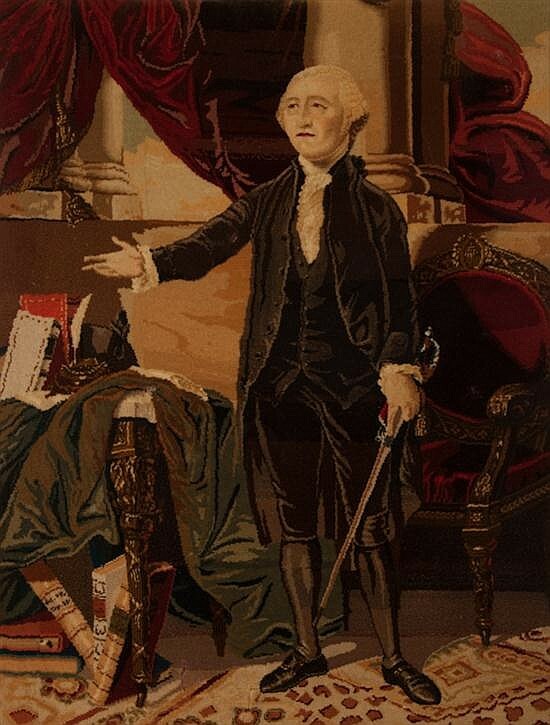 This woven portrait of George Washington was manufactured in England by the Crossley Carpet Co. in mid 19th century. Crossley carpets covered important floors in castles, houses, palaces and public buildings. Fearing he was running out of floors, Mr. Crossley announced he wanted to cover walls as well, and began to manufacture carpet tiles to frame and hang on walls. Portraits of shepherds, gardening girls and celebrities became available, all woven like carpets. This Washington image was created to coincide with the centenary celebration of 1876. 20" x 30". $1200.